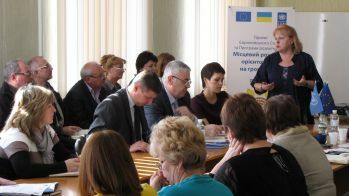 The Third phase of joint EU/UNDP Project “Community Based Approach” was officially launched in Luhanska oblast on 9 October 2014 during regional seminar and donors meeting in Severodonetsk. 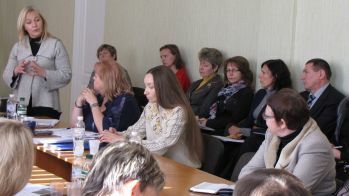 Distinguished attendees included Mrs. Inita Paulovica, the UNDP Deputy Resident Representative in Ukraine, Mrs. Elena Ruditch, CBA Project Community Development Specialist, Luhansk oblast state administration authorities, leadership of rayon state administrations and rayon councils; and heads of village and city councils. The deputy head of Luhansk oblast state administration Olha Lishnyk in her welcoming speech stressed on the importance of any aid for Luhansk oblast and thanked for an opportunity to pa rticipate in the the Third phase of EU/UNDP Project “Community Based Approach”. Mrs. Inita Paulovica also underlined that cooperation with Luhansk oblast was always fruitful and also suggested models for addressing challenging issues for other oblasts of Ukraine. Thanks to joint efforts of UNDP, local authorities and private investors for the first time in Ukraine a unique project for “Methane capture and utilization from solid domestic waste landfill in Oleksandrivsk, Luhansk oblast”. Unfortunately the landfill was damaged during military operations. The projects “Community Based Approach”, “Programme for sustainable development of Luhansk oblast”, Small grants programme of Global ecology fund helped to achieve great results and showed an example to other oblasts. During regional seminar an Action Plan for Project implementation in oblast and also a plan of measures for preparation to the upcoming winter was introduced. 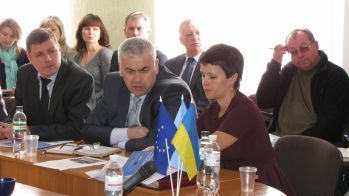 Implementation of the first phase of CBA Project commenced in Luhansk region during December 2007. First phase was succeeded by a second phase in July 2011. Over these two phases 68705 of men, women and children of the region have benefitted from improvement in 28 schools/kindergartens, 6 healthposts, 30 water supply, 24 street-lightning and so on. This happened through joint effort of the citizens, oblast/rayon/local level governments, CBA Project and the private sponsors.